It was Christmas Day 2004 that we saw our first Bongo. We were standing on the roof terrace at Hampton open air pool, clutching hot coffees, looking down into the car park, and there it was. That Bongo, it turned out, was newly purchased by some friends. We all had a look and decided yup, it was the vehicle for us. 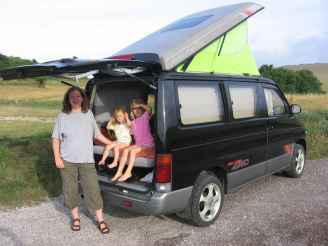 We could pack it full of kids for trips to the park and go camping in it. Fantastic. We didn’t have any money at the time so set about researching/day dreaming. Should we go down to Tilbury docks and bid on one? Should we buy one off the forecourt, ebay or the Thames Valley Trader? Then we came across import schemes. The rationale is this: you give your vehicle specs to a company with expertise in this area. They find and bid on a Bongo for you at auction in Japan, import it and deal with all the paperwork and mechanical necessaries for which you pay them a fee plus the cost of any work. But because it is imported in your name as a private individual, it attracts less duty so saves you money. It sounded to us like a no brainer. We read the reviews, kept an eye on websites offering the service, had an exchange of emails and decided to do it. We could get a Bongo on the road within eight to ten weeks for £5000. Two years later in February 2006 we were ready to move on our dream. We sent an email expressing our interest and later the same day had a chat with the charming rep from the import company. We sent over our cheque for £350 (a fee that’s returnable until a car has been bid on and won at auction) and our specs: four wheel drive, low mileage, high roof, black. Over the next three weeks we received details of three vehicles coming up at auction. One was the right colour, but a 2WD. The next had high mileage. Like Goldilocks, the third one was just right. We went for it (or rather someone else did on our behalf) and the Bongo was ours for £3,150. We transferred the funds and told friends excitedly all about our new Bongo. ‘Ooh,’ they said, ‘you are brave. I wouldn’t hand £3,500 to an internet site.’ We went a bit quiet and pondered. Then we began to wait. And what a wait it turned out to be. First there was a delay getting our vehicle on board a cargo ship. Then the vessel was ‘trans-shipped’ – it went via Copenhagen and sat in the dock for a month while it was unloaded and reloaded. Easter came and went and we shivered with our five and two-year-old children in a tent on Exmoor. We had a little frisson or excitement just after Easter when a letter marked ‘HM Customs’ landed on the mat confirming arrival of Bongo chassis number 101690 at Dover, registered in my name. Oh the thrill of knowing for sure that it existed and we had not been taken for £3,500 by a fly-by-night operator. Could we send around £1,300 post haste for the duty fees? Off went another wedge of money. The next delay was in getting the Bongo out of the docks. The trans-shipment meant three ships had arrived at once so the company doing this part of the job was, well, overstretched. Finally, out she came and into the workshop in Bristol. We were sent an email with a schedule of works necessary for the MOT and some items we might like to consider. We said yes to a new cambelt and tensioners and an immobiliser. Everso sorry but on account of one of her mechanics being off sick it would take, ahem, rather longer than expected. Whitsun half term came and went. The weather was better for camping than at Easter. The work was duly carried out and the day of the MOT test arrived. It failed. A small point to do with a brake cable but another small expense. And oh, the battery kept draining. Would we like a new one – or two since the Bongo needs a leisure battery? That’d be around £50 a pop plus VAT. Total on mechanics so far: just over £1200. So, with paperwork in hand, and a camping wedding in Berkshire lined up for a few weeks hence, I set off for DVLA Wimbledon to register and tax the Bongo. The wait wasn’t too bad and half an hour later I was on my way back home, with a spring in my step. Ha! I hadn’t figured with the next hurdle. Instead of issuing registration papers, DVLA called our Bongo in for a spot check on the chassis number. One in 10,000 Japanese imports is thus affected, we were told. Which is cold comfort when your vehicle is in Bristol and DVLA would like to see it in Wimbledon on Monday, And no, you may not drive it there. Seen the cost of a low loader Bristol to London lately? The import company were very helpful and said if we could get the inspection changed to Bristol she would take it down but would have to charge £50. Now, calling a local DVLA is no simple matter. You ring Swansea who relay your number to Wimbledon who call you back, ask the exact nature of your call, find an answer and call you back. If you happen to be away from your phone, say because you have to go to the bathroom, they leave a message to say they called and couldn’t reach you. Then it’s back to Swansea. And so it goes on. Eventually I managed to speak to someone looking at my paperwork and he said yes, he could transfer the inspection to Bristol and would fax the paperwork over post haste. It could take two to four weeks to get a new inspection date. By this time we were 16 weeks into the process and I was at the end of my tether. So I called the importer. He listened carefully to what I had to say and pointed out that none of it was, strictly speaking, his fault. If you take a flight with BA, he argued, they can’t guarantee that the plane won’t break down. Yes, but, if it does they put you up in a five star hotel and pay for your food until they can get you home. That’s what I should have said. Instead I said weakly that this wasn’t the point and I didn’t expect to wait 16 weeks. He said he would cover the £50 to take the vehicle to DVLA in Bristol. Two weeks later DVLA had not been in touch. I called. They had no record of my having ever been in touch. I think they sensed my near despair and had the head of inspections call me personally and leave his direct line. A date was made two weeks hence for the inspection. We had perfect weather for the wedding and thoroughly enjoyed staying in our tent, since you ask. We were all set. Insured, taxed, number plates in place and ready to go. It had taken 20 weeks but we had a Bongo with a full service, new cam belt, new batteries, alloys, 18,000 miles on the clock and an interior to match. All for £6,500. It is, by any stretch of the imagination, a bargain. Oh you should have seen our smiles when we first set eyes on her. Lovely. And we have had so much fun since, camping out at the seaside and carting Bongos full of children hither and thither. What a laugh. So in short, if you are looking to use an import scheme, our advice would be to go ahead because you could end up with a bargain and it could take the eight weeks advertised. But don’t bank on it. You might be in for a much, much longer wait than you hoped for.